Following the recent elections, PM Najib Razak is facing the rise of a political “Malaysian tsunami”. The word “tsunami” became politically controversial in the aftermath of Malaysia’s 13th General Election on May 5, which saw the ruling Barisan Nasional (BN) receiving a fresh mandate to lead the country, albeit with reduced votes and fewer parliamentary seats. BN has ruled Malaysia since the 1950s, making it one of the longest-running elected party coalitions in the world. The word “tsunami” is being used to refer to the wave-like surge in votes coming from the urban areas of Peninsular Malaysia in favor of the opposition Pakatan Rakyat (PR) coalition, which almost toppled the BN majority. In fact, PR won 51 percent of the popular votes but due to distortion in the distribution of parliamentary constituencies, it only got 89 seats, to the BN’s 133. Prime Minister Najib Razak sparked the controversy when he attributed the loss of several BN candidates to last-minute support given by Chinese voters to opposition candidates. He called it the “Chinese tsunami”. Election analysts have debunked this assertion. While it is true that many Chinese are dismayed by some BN-led government policies, in particular the affirmative programs that gave preferential treatment to Malay citizens, their numbers are actually not significant enough to affect voting results. What really hit Najib’s administration was an urban tsunami, in which a swelling of votes for the opposition came from the nation’s multi-ethnic urban areas. These votes reflect the declining popularity of Najib’s administration among urban professionals and young voters. Significantly, these voters comprise the demographic in Peninsular Malaysia who are very vocal, both offline and especially online, about public issues like corruption, good governance, human rights, election fraud and media freedom. Making matters worse, Najib made the “Chinese Tsunami” remark while also calling for national unity and reconciliation. How can he now appear to be sincere? Beyond damaging his own support base, the comment could inflame race-based political sentiments, creating yet more divisions in multiracial Malaysia. But Najib is plagued by a bigger problem. The opposition has refused to accept the voting results. On May 8, PR organized a protest near Kuala Lumpur that was attended by more than 60,000 people. Opposition leader Anwar Ibrahim vowed to hold more rallies in other parts of the country to prove that the popular sentiment in Malaysia is that of disgust with the fraud and other voting irregularities allegedly committed by BN and its supporters. If this were an ordinary election, it would be easy to dismiss PR as an arrogant party refusing to concede defeat. But election watchdogs, scholars, and many in Malaysia share the suspicion that the recent election may have been less than fair and clean. Even the United States government has advised Malaysia to probe the alleged irregularities. If BN truly intends to remedy the matter, it must immediately undertake electoral reforms. Otherwise, public discontent might unleash a backlash that the BN-led government cannot handle. Last year BN survived the Bersih (Clean) election reform rallies, Malaysia’s answer to the Arab Spring movement. But can it withstand the “Malaysian tsunami”? Malaysia’s ruling party has won the recent election by a narrow margin, amid irregularities at the polls. 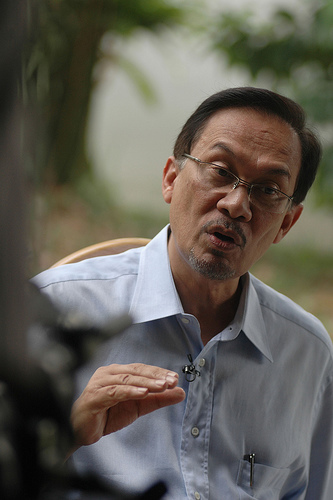 Anwar Ibrahim Unveils Election PledgesWhat Does Malaysia’s Shock Election Result Mean For its Future?Malaysia’s Election Will Test the Country’s StabilityWhy Boycotting Malaysia’s Election Makes SenseCan Malaysia's Opposition Win?